Major part of modern research is trying to find patterns in the given dataset using learning methods. One of the methods that can use a priori information for such purpose is Markov chains, in which the probability of symbol occurrence depends only on previous symbol (appropriate for the dinucleotide modeling). 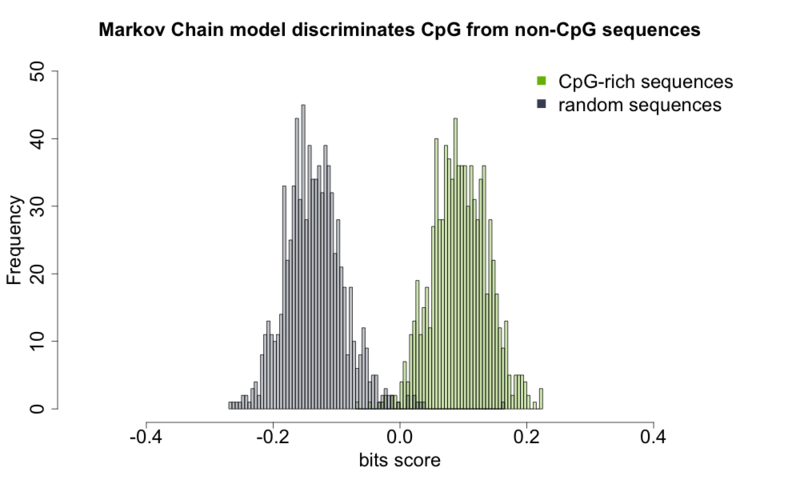 The question I am addressing here is – given the random sequence from mouse genome, can you predict that this is a CpG island? In the next few lines of code you will find many useful approaches to MC modeling, splitting of odd and even elements of R vector using “substring” function, querying the UCSC database solely via R, and informative visualization with transparent histograms. Note that I got sequences from BSgenome.Mmusculus.UCSC.mm9 library, which contains complete mouse genome. Since the download of the same might be tedious for some (~750mb), I uploaded the cpg and random regions to pastebin. Similar to the HMM example from previous post, the Markov chain is also based on Durbin (1998.) book. This entry was posted in R by mintgene. Bookmark the permalink.